You are here: Home | ASEAN | What is RCEP? The tenth round of negotiations of the Regional Comprehensive Economic Partnership (RCEP) saw the participation of 700 officials from 16 countries, including Korea, China, Japan, Australia and India. They held free trade talks covering 14 areas like commodity, service and investment. Beijing is a key driver of the Regional Comprehensive Economic Partnership (RCEP), a proposed 16-nation free-trade area that would be the world’s biggest such bloc, encompassing 3.4 billion people. RCEP was first conceived by the 10 members of the Association of Southeast Asian Nations (ASEAN), but China is increasingly prominent as backer of the proposed pact. While RCEP has largely been seen as an alternative to US-led trade plans, some say that view is evolving. 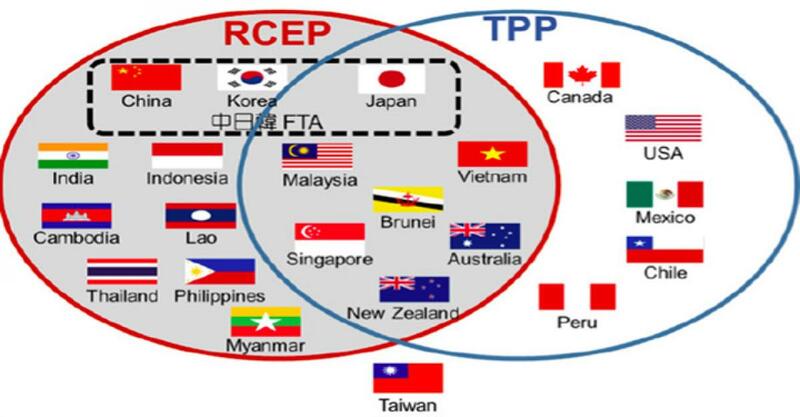 China may ultimately look to steer RCEP talks towards a broader pact that would encompass TPP into a Free Trade Area of the Asia-Pacific (FTAAP) – an idea first put forward by the Asia-Pacific Economic Co-operations (APEC) grouping. Australia, Japan, Malaysia, New Zealand, Singapore, Vietnam and Brunei – are in both TPP (Trans-Pacific Partnership) and RCEP. The TPP deal, reached on October 5 after marathon talks between the United States and 11 Pacific Rim nations, aims to liberalise commerce in 40 per cent of the world’s economy and would be a legacy-defining victory for President Barack Obama.